The handling of Chris Froome's adverse drugs test by cycling authorities is a "scandal" and a "double standard" is being applied, says four-time world time trial champion Tony Martin. Four-time Tour de France winner Froome had double the allowed level of legal asthma drug salbutamol in his urine during September's Vuelta a Espana win. "I am totally angry," said Martin. "There is definitely a double standard being applied." However, under governing body UCI's anti-doping rules, the presence of specified substances like salbutamol in a sample does not result in a mandatory provisional suspension and the body has asked Froome for more detail. Froome, who became only the third man to win the Tour and Vuelta in the same season this year, was notified of the adverse analytical finding, from a test on 7 September, on 20 September - the same day he won individual time trial bronze at the World Championships. "He and his team are given time by the UCI to explain it all, I do not know of any similar case in the recent past," said Martin, who finished ninth in the individual time trial in Bergen, Norway. "That is a scandal, and he should at least not have been allowed to appear in the World Championships." Martin added he had the "impression that there is wheeling and dealing going on behind the scenes" and questioned whether Team Sky and Froome enjoy a "special status". When asked by BBC Sport if he was made aware of Froome's adverse test while he was UCI president, Brian Cookson denied he had any "role or influence" in the case. "I had then, and still have today, confidence in the integrity of all those involved, that they would always follow the correct procedures in every case, and that no rider was treated in any way differently from any other." Martin added that the UCI's actions were a "major blow to the difficult anti-doping fight" he said he is leading alongside the likes of compatriot and team-mate Marcel Kittel. "We need a consequent and transparent approach by the UCI. What is going on here is inconsequent, not transparent, unprofessional and unfair," he said. Last month, Froome announced his intention to race in the 2018 Giro d'Italia in an attempt to win a third Grand Tour in a row. Giro organisers RCS Sport said it was not warned about Froome's adverse test and learned of it through the UCI press release on Wednesday. A statement read: "Chris Froome's decision to participate in the 2018 Giro d'Italia was his own, taken along with his team's management, and is a choice that RCS Sport, as organiser of the Giro d'Italia appreciated; no money has been paid to the rider by RCS Sport. "Both RCS Sport and the Giro d'Italia's race direction reaffirm their full support of the Cycling Anti-Doping Foundation (CADF) and will respect whatever decisions are to be taken in the future." Meanwhile, Froome, who has suffered with asthma since childhood, said that he is "sad" over misconceptions about athletes and salbutamol use. "My hope is that this doesn't prevent asthmatic athletes from using their inhalers in emergency situations for fear of being judged," Froome posted on Twitter. "It is not something to be ashamed of." The urine test, taken on 7 September, showed Froome's levels of salbutamol were at 2,000 nanograms per millilitre (ng/ml), compared to the World Anti-Doping Agency's (Wada) threshold of 1,000 ng/ml. He could be banned if he fails to explain the finding and, if so, he faces being stripped of his Vuelta title and two World Championship bronze medals, while he could also miss next year's Giro d'Italia and be unable to defend his Tour title in July. 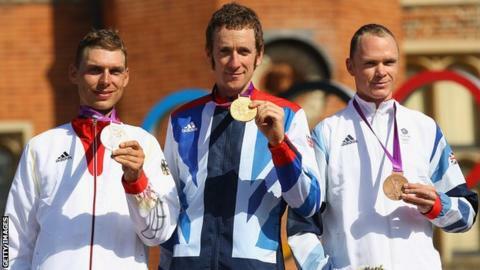 Froome has told the BBC there was "no wrongdoing" and says his legacy will not be tainted.